Officer Keltner, thank you for your service and the sacrifices you made for McHenry County. May God bless you and your family.
" 'Blessed are the peacemakers, for they will be called children of God' (Matt. 5:9)." our heartfelt condolences to the family (blood and blue) and friends of Deputy Sheriff Keltner. Such tragic loss is not in vain, and he will not be forgotten by our community of Rockford, Illinois. May he rest in heavenly peace. May the Lord bring healing to the family, friends & fellow officers. God Bless you Deputy Sheriff Jacob Keltner ❤️, Rest In Peace. We are so thankful to you for your service, your devotion and your sacrifice. We are so saddened by this terrible news!! Our thoughts and Prayers go out to your family, and all of your sisters and brothers in Blue that protect us. God bless you all!! TO THE FAMILY, FRIENDS AND COLLEAGUES OF MCHENRY COUNTY SHERIFF’S OFFICE, DEPUTY SHERIFF JACOB KELTNER. My heart is filled with great sadness at learning of the lost of your loved one and fellow Deputy Sheriff. We in the law enforcement community are a family, although our uniforms may be a different style and vary in color, a badge, shield or star may be pinned upon our chest. Our areas of enforcement may vary but our goals are the same, to Serve and Protect our communities. We consist of many different agencies from across the nation, for we are: Municipal Police Officers, Sheriff’s Deputies, State Police Investigators, State Highway Patrol Troopers, Conservation Police Officers, College Campus Police Officers, Correctional Officers and Federal Agents just to name a few. We patrol small towns, large cities, college campuses, county roads, state highways, state prisons, county jails, state parks and the United States Borders. Whether active duty or retired, we are one family, a Law Enforcement Family, the thin blue line of protectors, brothers and sisters bonded together by HONOR, SERVICE and PRIDE. Daily we honor our fallen brothers and sisters never forgetting their sacrifice and the sacrifices of their families. Daily our position is clear that we will Serve and Protect our communities without faltering and with no hesitation. Daily we show pride in our chosen profession Law Enforcement, for we willingly walk the line of good over evil facing the unknown with courage keeping our trust and our faith in GOD. We know that evil roam these streets and at any moment in the course of performing our duties the ultimate sacrifice might be required of us in the service to our community, for Law Enforcement is not a job but a calling and only a few will make the decision to commit to that calling to serve for some will give all that they have. ALL LIVES MATTER - LAW ENFORCEMENT OFFICERS SHOULD BE RESPECTED - If we don’t respond to that call for help, or investigate that suspicious subject(s), or stop for that stranded motorist, or rush to that call of shots fired, then who will? You did not die in vain. You sacrificed your life in the service to the citizens in McHenry County in the State of Illinois with HONOR, PRIDE and DISTINCTION. I’m proud to have worn the uniform of a law enforcement officer like you did. I’m proud to have pinned the badge upon my chest like you did. I’m proud to have Served and Protected my community as you did. I’m proud to call you my BROTHER! I commend you my fallen brother for making the ultimate sacrifice in the performance of your duty. For you left us doing what you chose to do. Performing a job you were trained to do. Upholding the oath you swore to do. Most importantly doing what you loved to do.............Serving and Protecting your community with Honor and Pride making a better and safer place for us all. 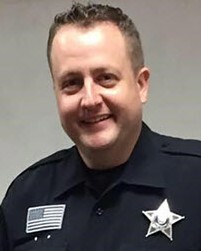 Attention All Units.............................................McHenry County Sheriff’s Office, Deputy Sheriff Jacob Keltner having served the citizens of McHenry County in the State of Illinois with HONOR, PRIDE and DISTINCTION is now 10-42. Godspeed to the Family , Friends & Survivors, Fellow Brothers & Sisters in Law Enforcement of Jake Keltner. Our collective hearts ache with sadness, in your great loss. Thank You for your Heroic and Lifetime of Service. All give some, some give all. Rest in Peace! I am so sorry for your loss. I know it doesn’t help but Jacob is a real hero. You, your children and the department are in my thoughts and prayers. The thoughts, hearts and prayers of everyone here at CCPD go out to the families, both blood and blue, of Deputy Keltner. May the Good Lord give you strength, comfort and peace. Rest In Peace Brother in Blue. Thank you Hero for your sacrifice and service. Thoughts and prayers for your family, friends and brothers/sisters in blue. Rest in peace Sheriff Keltner! Final Salute Deputy Keltner. Thank you for your service. You are a hero. Rest peacefully in the presence of God. We are praying for the family and fellow officers. On behalf of the Ohio Bureau of Investigation & Identification our thoughts and prayers are with the immediate family of Deputy Sheriff Jacob Keltner and the extended law enforcement family of the McHenry County Sheriff's Office, Illinois. End of Watch Thursday, March 7, 2019. Rest in Peace brother and watch over us. We will protect and serve from here on in your honor. Thank you for your service, may you Rest In Peace. Zone Five Regional Law Enforcement Academy Session 66 Schenectady N.Y. Thank you for your service and Rest in Peace. Our loss is Heaven’s gain. May the Lord bless all those you left behind. RIP brother, you will never be forgotten.